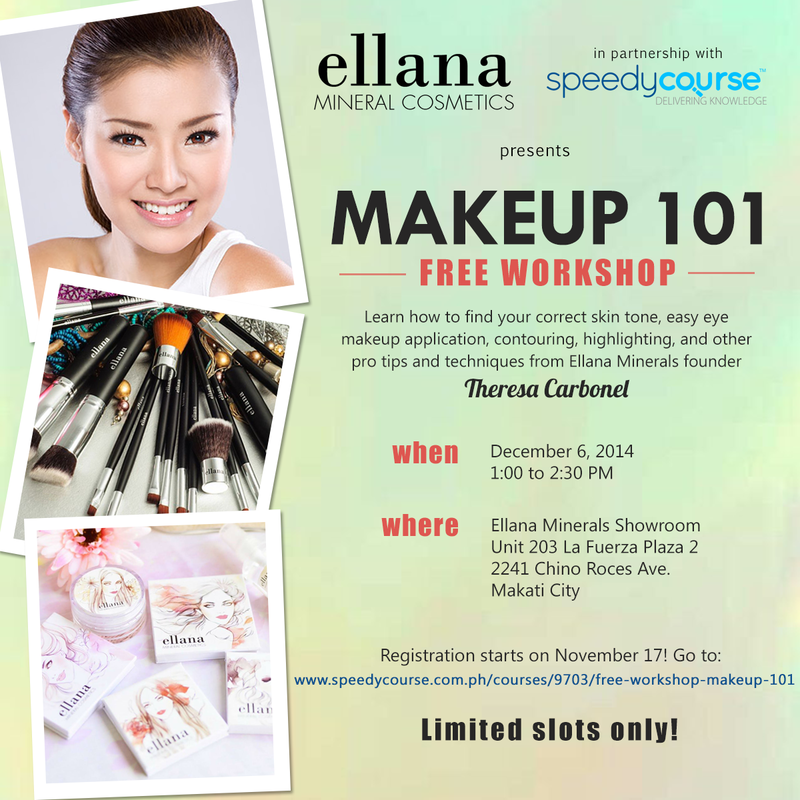 Free Workshop: Makeup 101 by Ellana Minerals and SpeedyCourse | Vanity and Everything in Between. Calling all makeup beginners and enthusiasts! Ellana Mineral Cosmetics has teamed up with SpeedyCourse.com.ph to give you an early holiday present: a FREE Makeup 101 Workshop. Learn how to find your correct skin tone, easy eye makeup application, contouring, highlighting, how to match your blush with your lip color and other pro tips and techniques from none other than Ellana Minerals founder Theresa Carbonel. Participants will also get a 10% discount on all Ellana Minerals products. The workshop will be held on December 6, 2014, from 1:00 to 2:30PM at the Ellana Mineral Showroom in Makati. Registration starts on November 17! To register, go to www.speedycourse.com.ph/courses/9703/free-workshop-makeup-101.